Susan Christ joined the Single Adults Advocacy Committee to talk about the Department of Veterans Affairs (VA) new program in partnership with TriWest Healthcare Alliance. This program is a public-private partnership that will connect women Veterans who are homeless or at risk of being homeless with meaningful, stable employment. Here’s what Susan shared about the program! In partnership with VA, TriWest Healthcare Alliance identifies employment opportunities by working closely with female Veterans with children to match their interests and skills with employers who value these qualities and recognize that our nation’s Veterans are ideal job candidates. Our benefits advisors will meet any referred veteran in the community or at a partner organization’s facility to obtain necessary referral information and begin services to the veteran. View the referral form, request for release of information and initiative fact sheet. Susan Christ mentioned that you may not have all of the information requested on the referral form, but it is fine to just fill in what information you do have and make the referral, they can fill in the blanks as they work with the veterans. Also, the release of information form can be obtained from the veteran by our benefits advisors at their first meeting with the veteran, so it is not absolutely necessary that this form is complete when the referral is made. If emailing referrals, please only include the referred individual’s first name and last initial. You can direct emails and referral forms to: veteransemploymentvbaco@va.gov. This reflection on the 2015 One Night Count was originally published on the Compass Housing Alliance website. Tyler Roush is the communications manager for Compass Housing Alliance and was also an action team member on the One Night Count in the Southwest King County Headquarters. They were counted huddled in a doorway or in a tent beneath a freeway overpass. Sleeping in a car parked in the lot of a sprawling retail store or riding a bicycle, their possessions slung to one side. In the early morning hours of Friday, Jan. 23, volunteers with the One Night Count filtered through areas of Seattle and King County where homeless people are known to sleep. What they found would break hearts. In just three hours, volunteers organized by the Seattle/King County Coalition on Homelessness counted 3,772 people living without shelter in King County, a shocking 21 percent increase from last year’s total. (Due to the nature of the count, results are always assumed to be underreported.) The number is stark evidence of the need for more services for those who are homeless. The survey area did expand this year to both previously included and new areas in the Southwest King County region. The Coalition organized the expansion in partnership with the King County Housing Authority (KCHA), which hosted volunteers at its headquarters in Tukwila. About 35 volunteers, many of them KCHA employees, began to gather shortly before 2 a.m. to meet up with their team leads, collect maps of their survey area and discuss ground rules. In the three short hours ahead, they would be tasked with counting the people living without shelter in their area. Mark Abernathy and Chris Clevenger, both KCHA employees, were participating for the first time. Their survey area took them along a heavily trafficked stretch of highway, where people are known to sleep in their cars. They soon learned the telltale signs—fogged windows or a reclined seat are indicators that someone might be living in their vehicle. “You’re never going to look at parked cars the same way again,” said their team leader, KCHA’s Kristy Johnson. Their experience highlighted a fundamental duality in the process of the One Night Count. Each time they counted a person they felt a wave of adrenaline in accomplishing their mission. But that success was overwhelmed by a feeling of profound sadness for another person failed by our social system. Wherever they visited, they said they never felt unsafe to be there. “If it wasn’t safe, we figured they wouldn’t be there either,” Mark said. In one instance, Chris described walking along a fence line in a park when he came upon a lean-to, carefully assembled with tree branches. “It was clear that someone had slept there, but that it had been a while,” Chris said. “Seasonally it makes sense — tree branches don’t keep out the rain. As it did elsewhere, the One Night Count in Southwest King County brought people together from across the region. Laurie Gruel traveled farther than most to participate, coming from the Tri-Cities with her husband. Laurie’s survey area took her team through a park, where they saw two men talking near a tent. One of the men spoke to them, and they asked if the two were sleeping in the park. He confirmed that they were. She added that the nighttime endeavor helps put homelessness into an appropriate context. “When you see someone sleeping under a tarp in the rain, and you’re worried about getting your feet wet, that puts things in perspective,” Laurie said. Altogether, 209 people were counted as having no shelter in the Southwest King County count area alone. Lisa Espinoza, who lives within the area surveyed, said she was surprised by how many they found. Her group counted one woman, huddled by a dumpster in an alleyway, asleep. “Vulnerable, that’s how it feels to me,” she said. Other counters noted a significant number of younger people, ages in their teens or early 20s, alone or sometimes in groups of two or three. A number of people had bicycles, a backpack or a few possessions strapped to one side; one young man had a boombox playing loud music in the damp night. “Maybe we need to look at serving younger people,” said Linda Hargrove, a volunteer who works at Plymouth Housing Group. For too many people, homelessness is not a brief or temporary experience, but one that lasts for years. Some of the tenants Linda works with had been homeless for 10 or 15 years before securing stable housing. “There but for the grace of God go I,” she said. Among the people who gathered in the early morning hours at KCHA headquarters, perhaps none understood the experience of living without shelter like Kirk McClain. From 2009 to August of 2014, Kirk was one of the thousands of the people living without a home in King County. Now, with a new job and a place to live, he participated in the One Night Count for the first time. After returning from the survey, he recalled a life without shelter. He said he knew of certain places, such as on the grounds of a hospital, where he might find warm air blowing from a vent. But almost without fail, a security guard would disturb his rest and tell him to move along. One night he came upon a hatchback vehicle bearing a company logo parked on a side street. He looked inside and could see boxes and trays of food. A debate began to rage within him. But he didn’t. He closed the door and turned. A woman was watching from her balcony. “I looked at her, as if to say, ‘You saw I didn’t do it,’” he said with a smile. He was afraid she would call the police; instead, she came downstairs, bringing him a sandwich, soda, pieces of fruit and granola. They spoke for more than an hour. “It was one of the greatest experiences of my life,” he said. Though he was homeless for five years, Kirk didn’t fit the profile of homelessness — his story is further proof that there is no profile. A certified paralegal with a Bachelor’s Degree in pre-law, Kirk had a job and a home when the recession struck. By 2009, he was out of a job. Before long, he was staying with friends. Later, he was sleeping outside. “I became homeless because I lost my job,” he said. Check out this article with a Call to Action from Alison Eisinger to contact your councilmembers today! Councilmembers vote on the budget this week and need to hear from you. Scroll down for messaging. In 2005, housing advocates in King County announced a plan to end homelessness within a decade. Since then, the community has produced 5,600 units of permanent housing for the homeless, more than anywhere in the U.S. except New York and Los Angeles. This year alone, more than 2,000 formerly homeless people have moved into permanent housing. Despite those improvements, and even as the economy booms in the region, the homeless population continues to inch higher. “Last year, we had 10,000 households that were homeless in King County and 5,000 of them were newly homeless,” said Mark Putnam, director of the Committee to End Homelessness in King County. 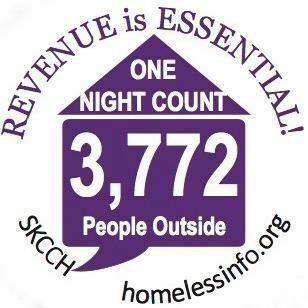 This year’s One Night Count of homeless people found 3,123 people living outside, a 14 percent increase over 2013. At the same time, 6,171 homeless people lived in shelters or transitional housing. The fast rising rents, low vacancies and high cost of living in the Seattle area have pushed more people to live in their cars or on the streets, according to advocates. Some are newly arrived residents who were drawn to the area by the booming economy. “I’ve heard many a story of people that thought moving here with a couple thousand dollars would be enough for them to get on their feet, find a job settle and kind of settle in, and it’s not,” said Putnam. Putnam said housing advocates will be asking state lawmakers to put $100 million more into the housing trust fund in the next budget. That pays for the construction of affordable housing across the state. In Seattle, homeless advocates are looking for an additional $1 million to add emergency shelter beds this winter. “There are opportunities right now for both the Seattle City Council and the King County Council to approve budgets that increase the capacity for places where people can be overnight during the winter months,” said Alison Eisinger, director of the Seattle/King County Coalition on Homelessness. Homeless advocates are also pushing the King County Council to extend permits for temporary homeless encampments, also called tent cities, in unincorporated areas. Legislation now under review would allow an encampment to stay in one place for about four months, one month longer than is currently allowed. Homeless residents testified in favor of the legislation before the King County Council this week. The County Council will vote in December on whether to extend permits for homeless encampments. Council members are reportedly divided on whether to require tent city residents to submit to criminal background checks when they move into a new neighborhood. Please call your King County Councilmember and leave this message: “I don’t want veterans [the homeless unsheltered] on the streets in my community. FULLY FUND the King County Winter Shelter in the 2015-16 budget. Bring 100 men inside from October through May. Don’t short-change homeless people.” The final budget is being put together THIS WEEK. Thank you! For more messages, check out our Advocacy Postcards. The most recent Single Adults Advocacy Committee meeting on Thursday, October 9 was focused on our community’s involvement in the national 25 Cities Initiative, designed to reduce homelessness among veterans and people who are chronically homeless. With that included how ’25 Cities’ relates to coordinated entry for single adults, and how we can be good informants and advocates as these policies, programs, and budgets are developed. Kelli Larsen, Director of Strategic Initiatives at Plymouth and a Design Team member for the 25 Cities Initiative, led us in conversation. The 25 Cities Initiative is in the twenty-five cities where Veteran Homelessness is highest. Goal is to end homelessness, and, locally, we know that a single solution – just increase housing, or just coordinate the stock we have – is not enough. Within this goal is a focus on creating and implementing a single adults coordinated entry, much like has happened with families (Family Housing Connection) and youth (Youth Housing Connection). This is not an easy, straightforward or simple task: the single adults population is much, much larger and still very diverse. Officially, the four principles guiding this complex coordinated entry process are: (1) assess, (2) assist, (3), match, and (4) place. More loosely, leads on this project want to ensure that the system they create and implement is simple, meets real needs, and has true benefits (that eclipse any inherent negatives). An example of the complexity is that it is not possible to screen thousands of single adults who are homeless, and perform regular check-ins. Our community has learned (and is still learning a lot) from the successes, complications, and frustrations associated with YHC and FHC. Plus, we want to be sure to coordinate the coordination that already exists. SAAC explored important elements of a coordinated entry system for single adults, as well as discussed positives and negatives of various components. The assessment tool of choice at the national level is the VI-SPDAT, which Kelli shared with the group. In conjunction with our local community’s involvement with the 25 Cities Initiative, this tool was tested within a handful of agencies. SAAC talked bout the positives and negatives of the tool, areas for improvement (e.g., wording, language, tone, etc. ), and what is missing. Some complicating factors are that this test does not appear to be adaptable, it doesn’t plug into our HMIS system, and the process for Case Managers to upload information had many glitches. Some SAAC members had administered the test, and shared their experience and feedback as well as compared it to the VAT. As a result of this conversation, Kelli will be sharing our valuable feedback about the VI-SPDAT with the ’25 Cities’ federal partners, as they are exploring ways to improve the tool with its designer, OrgCode. Other points of discussion centered around willingness and ability of certain folks who are homeless to easily complete the process, or gather necessary documentation to move into housing (when available). Also brought up were concerns over how an assessment could discern situational-related issues, length of homelessness, and changes over time with clients that would affect their ‘score.’ Many discussed the need for – and current examples of – continuation and coordination of care for single adults – now popularly termed “case conferencing and navigation.” In addition, the need for translation was reviewed. Speak out and call on community members to add bus service by voting YES for Seattle Transit! You should have already received your ballot — please call 206.296.VOTE to get a replacement ballot. Remember: every day until November 4th is election day because we vote by mail! Encourage those around you to vote, vote early, and vote YES for Seattle Transit – Prop 1. What’s better than one low income fare? Two that work together to keep our community members moving. We are thrilled to announce that Sound Transit is requesting YOUR input for their proposed low income fare program, which will be modeled after the low income Metro fare we worked so hard to win. Click here to take Sound Transit’s low income fare proposal survey, and be sure to add YOUR comments about how this fare would help you, your colleagues, and the clients and guests you serve. The deadline for submission is a mere 10 days away (10/23) – don’t wait to share your support! The Seattle City Council and the King County Council is in the process of meeting to set budget priorities and begin making adjustments to the Mayor’s and Executive’s budgets. We need to REPRESENT at these public budget hearings. Invite residents, guests, clients, co-workers, and community members to stand alongside human services workers and advocates as we press our budget recommendations. Not sure what’s at stake in the budget process? Check out our Budget Advocacy postcards to get on-point messaging! We encourage all those folks to fill out and deliver or send in the Coalition’s City and County Budget Advocacy Postcards (in the ‘What’s Hot’ box on the homepage). Thursday, October 23 at 5:30 p.m.
More information is available in the Coalition’s earlier blog post.